It's probably called Badcon these days, but we still just call it Burton Doubles. Having had the last two Burtons brutally affected by winter weather, I was feeling good about this year. 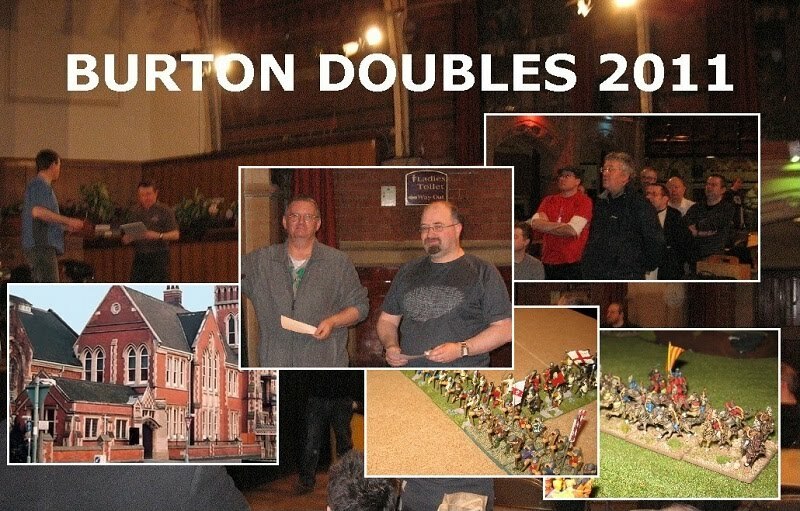 Although I have committed to a couple of Armati rounds, and the DBA League beckons, I have pretty much given up on 'full game' singles, these days (too long, too 'gamey' and a bit repetitive for my tastes, really) ... so the early year rash of Doubles events is something I look forward to. Following its time-honoured sequence, this year's event would be what was once the WRG Book IV period. So knights a-plenty. Mostly FoG, of course, there was also some DBM and MM. Although quite a few international players had already left for NZ, 50 (fifty) teams entered the FoG tournament, and we were graced with the celebrity authors ... Phil Barker playing DBMM, and author (and Society of Ancients co-Champion) Richard Bodley-Scott playing FoG. Everyone had a great weekend. Eric Doman made a rare appearance (not only is Eric a great player ... my one and only DBM tournament win was when standing in for Eric's regular partner in the Society of Ancients Doubles ... so he can clearly do well in even the least helpful of circumstances).. Taking advantage of the period, I chose to give my later Sicilians another run out ... a good excuse to continue/complete renovating this much-loved army that dates back to 7th Edition. In FoG, I think it combines the merits of being good-looking, effective and easy to play. Well the Phil Steele Version is easy to play, anyway (it is one of those lists that allows quite a bit of variation - which, as the list covers Angevin as well as Hohenstauffen, is about right): my simpleton's army being roughly 25% light foot, 25% light horse%, 25% knights and the balance in variable infantry. All the light foot and all the light horse have bows. So nice and clean, and not much fiddling or remembering to do. The Catalan Company proved a tough nut to crack ... there was terrain in the way of our knights, and try though we might, our skirmishers could scarcely dent the Almughavars (Wayne and Lynn had taken an IC, so we were trying to inflict multiple cohesion fails on superior troops with an IC in command range ... for non-Foggers still with us, that means morale tests with rerolls and modifiers in their favour, and we're usually going to get nowhere). We got some traction, but the Catalans are very dangerous as drilled Medium Foot outmanoeuvre Knights in FoG (pick the bones out of that if you will) and we got the worst of a timed-out game. We fared much better against the Greeks - an army much like the Sicilians but played much too aggressively given the fluid mix of troops they were up against. We had the tactical edge in a lot of otherwise straight up fights, and were about a turn or so off a decisive win when the sun went down. 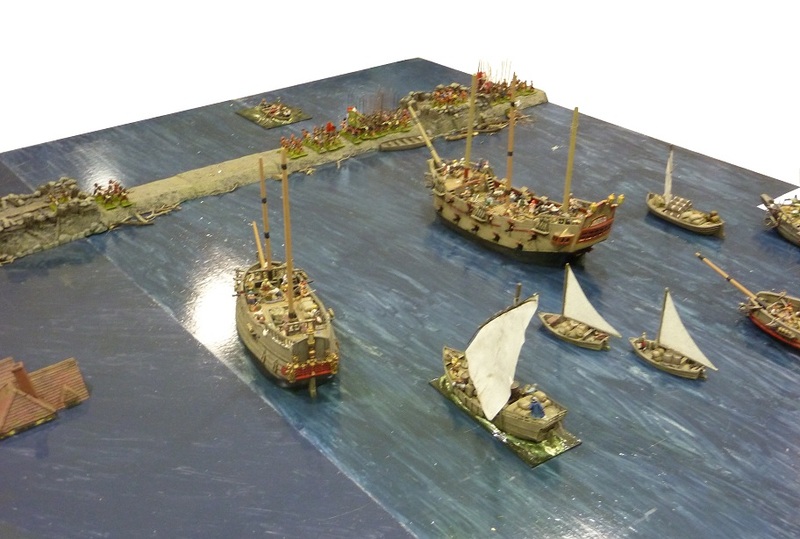 Our maximum win came against the English Longbows. Interestingly, our 25-0 at last years SoA Doubles came against English, too, so its 'single theory' is clearly weaker against a balanced but powerful army. We lost the opening initiative, which proved decisive: although they get the edge on terrain placement and deployment, we get to move first, and can, hopefully, steal any terrain near the middle of the table. 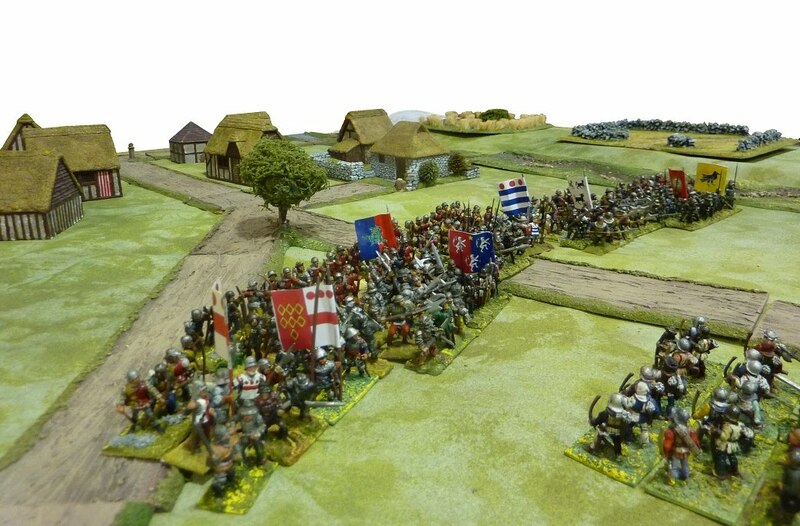 The game was resolved in a massed fight for a centrally placed enclosed field - defended by us with a skirmish line backed by Saracen close fighters ... attacked by Longbowmen. A slight edge to the Saracens in hand-to-hand if the skirmishers can protect them from the shooting. 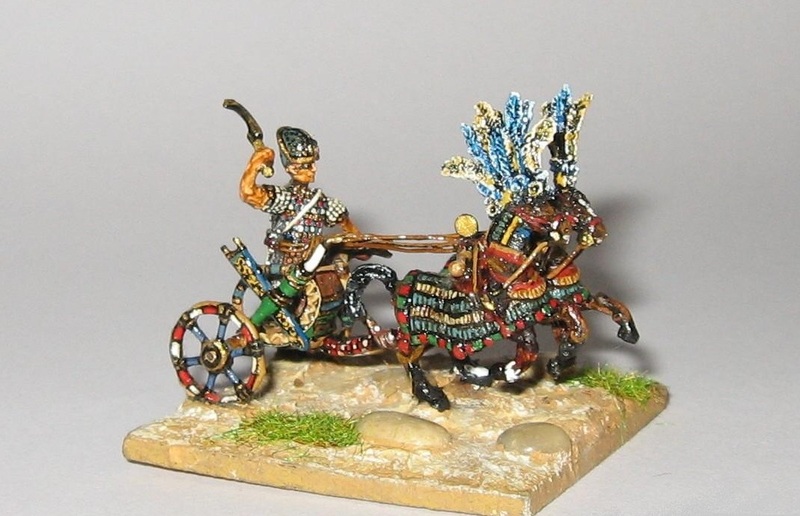 A better edge if the skirmishers can register some hits on the English too, before they have to run off. Which is what happened. On the other flank, our skirmishers ran rings around them and got even more traction. 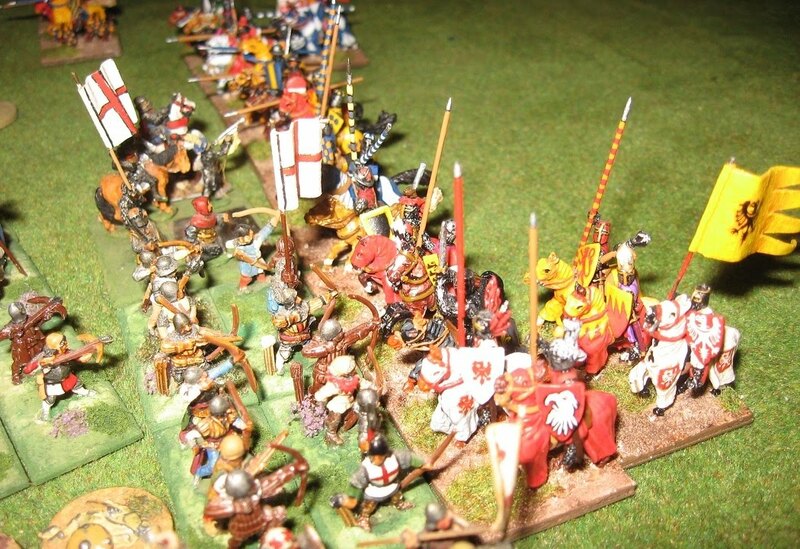 Then, with our lighter troops denying the English any security from the broken ground, the knights confidently went in on the archers in the open, survived the arrow storm, and put them to the sword. Against the Lithuanians, we pretty much executed our plans, but the dice gods did not play their part, and we were battling up hill (metaphorically) all afternoon. We got some good things going, but Lithuanians do run away extremely well. We lost a bit of time in a prolonged discussion of a tricky position where neither team really wanted to embarrass themselves by calling an umpire ... but, on reflection, it would have been wiser to do so, as four minds couldn't resolve it, so some time was lost from the game. Timed-out with the advantage to the Lithuanians. We came 15th out of 50 in the FoG. 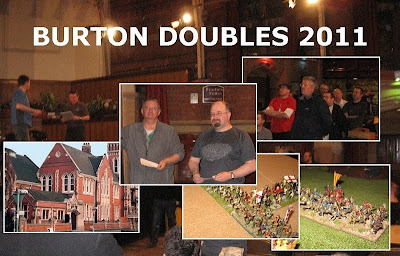 There are several one day Doubles rounds to come from the Northern League, the Society of Ancients Doubles Masters is in September (3rd and 4th) at Fitzharry's School, Abingdon. Details can now be found on the BHGS website. An example of one of the Commanders I use: a round staff element with a detachable personality (in this case the king of Navarre) ... on the base, the commander is acting in his normal command capacity; off the base, he is fighting in the front rank. After a few invitations, the Society of Ancients Shows North outfit went to Hammerhead. Although at Kelham Hall, Newark, Hammerhead is the Chesterfield club's annual show ... and one we haven't attended (it banners itself fantasy and sci-fi before getting to the wargaming bits ... two reasons why a dedicated historical organisation like ours might think twice). Actually, the organisers have been trying to get more of us 'historical' societies and exhibitors to go (to balance up the show a little better) and it is, of course, a chance for us to try rescuing a few lost souls. Kelham Hall is a fantastic venue, and one with which we are familiar (we already do both Partizan shows there) ... so is now our most frequent outing (assuming all will have us back). 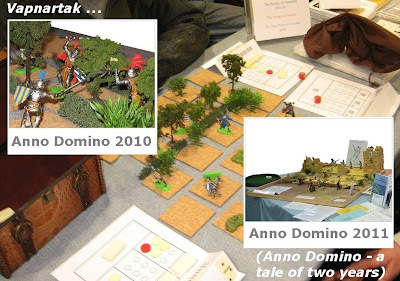 Like Partizan, we were part of a Society of Ancients/Lance and Longbow combo set up by Dave Lanchester (the two societies plus a game all zoned together): this arrangement seems to be working to everyone's benefit - so many thanks, Dave. 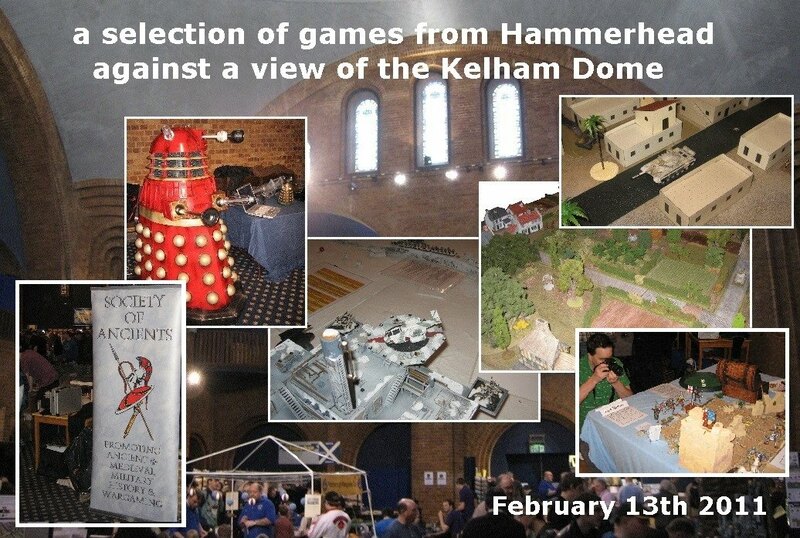 Unlike Partizan (where we are in the furthest room, down the corridor on the left), with Hammerhead more consciously looking for participation games and diverse content, we were in the main hall - Kelham's fabulous dome. I've put a few more overlaid pictures in this entry to give a hint of the splendid building in which this show takes place. It is, of course, Nottinghamshire (so, despite the sumptuous surroundings, a chip butty and a cup of tea will cost you less than an Excel or Clarence Dock Cappuccino). The Dome is a great location for picking up participation players - and an important mission as not everyone attending is there for their dollop of history. You get that message as soon as you walk away for a refreshment ... so many monsters and machines, too many goblins and geeks. 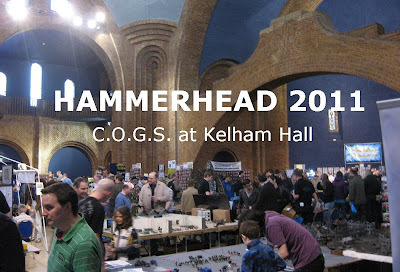 Hammerhead also has a Bring & Buy (something absent from Partizan for many a year): a good thing, as it keeps visitors up during the course of the day ... but not of much interest unless you like trays full of plastic Games Workshop stuff. Worth mentioning, of course, as I know lots of visitors like them (and may be wondering if Hammehead is worth a trip). Well, in an manner of speaking (we didn't have all of it, so had to improvise)... I still had the original tiles I lay out for my 'big figures' Gladiolus (which were used for the original GitS, so are in the box as back up). So it was back to just the raw components on the table merged in with some debris from the grit box. In fact, most of us liked the look of GitS Lite, which might also be a bit easier to get round. It needs some buildings in the background I'm sure - but now looks 'Salute-bound', so I need to get chopping polystyrene. We played several vigorous games, and my thanks to the team for letting me take some camera time. Watching them run the game I learned some of the street-talk for skirmish play ... slapping, 'pain phases', 'hurt markers' and such slack euphemisms. Hopefully we added something historical and entertaining to the mix. 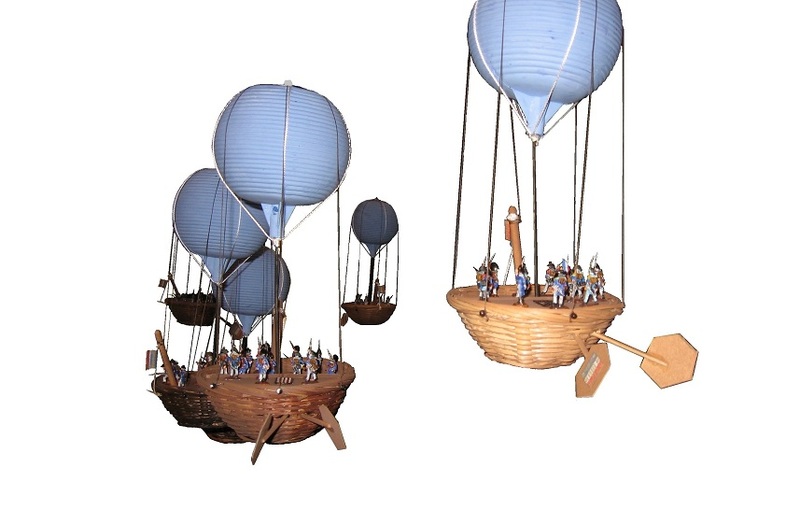 Also interesting, the Peterborough club had mounted a Napoleonic balloon invasion of England, inside a gazebo frame. 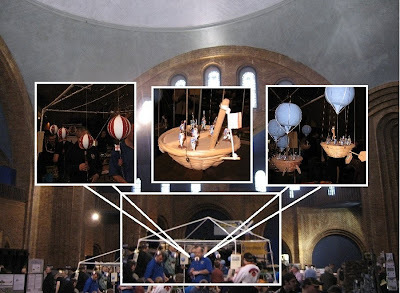 The balloons were hung from a net that was fixed as the ceiling (as it were) of the gazebo. 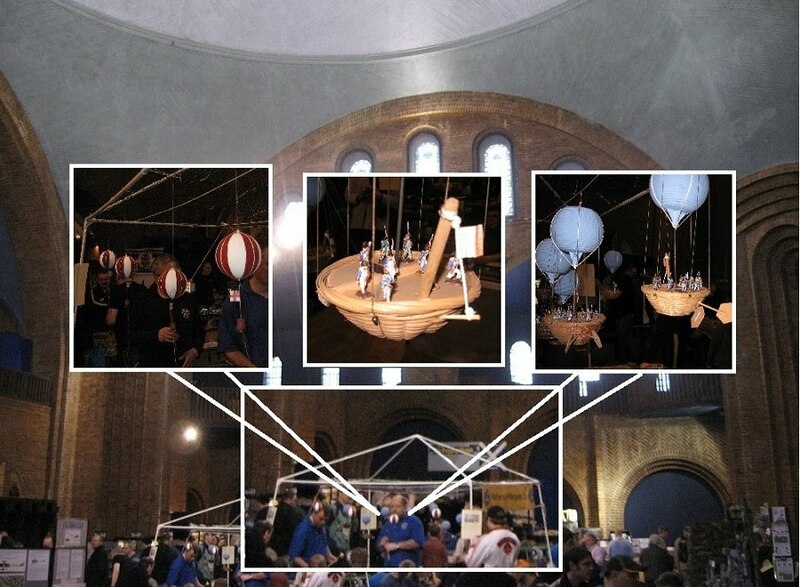 So, whether the 'overhead net' is the best way to do an aerial game I don't know - but well done to Peterborough for figuring out how to do it at a show (and then actually doing it). The toys were fun too. The show can be a scary place to walk round .. starships and space marines lurk round every corner. People sit down and play boardgames (like, just there, at the show ...) ... even the dragons outnumber the Tigers. Inevitably, I suppose, if any of this fluff interests me it is the stuff that looks most like a conventional historical battle ... so, properly based up 15mm stuff on sprawling landscapes easily beats individually mounted 28mm plastic in my book (strange how the idiosyncrasies of scale cross the genre boundaries ... even in its traditional place 28mm looks clumsy to me ...)..
And there were Daleks. Daleks are always good. In all, a very good day out. A nice location, and a good response to the Society from the visitors. A different selection of traders and exhibitors and some intriguing games. And all just up the road from Northamptonshire. Thanks C.O.G.S. See you next year I hope. Slingshot subscriptions are available online (here at the website), or you can catch up with my team at a UK show. We will be at WMMS if anyone volunteers to do it. Vapnartak at York Racecourse marks the beginning of our shows season, and our first recruiting opportunity of the 2011 membership year. We had an excellent and timely trip up and got some good parking near the loading/unloading access. This year we were back on the upper deck near the 'flea market' room (formerly 'Bring & Buy', and subject of much debate on other forums ... Vapnartak? A car parking and bring & buy topic, mostly ... well for us our first show of the year, great facillities and nothing much to winge about). That said, I hope they rotate this 'upper deck' berth: we take participation games, and so benefit from accesss to most of the showgoers, not just the 'second hand' punters and those who seek us out specifically. Given the 'wall to wall' 28mm static displays all over the ground floor, surely there is room for a bit more variety and a bit more 'participation'? I think the 28mm sameness of the display games is the only real criticism of this show (and one I've picked up elsewhere - it isn't just me ...). And it can be easily fixed. We were doing 'Greyhounds in the Slips', a year on from the project test, which was at Vapnartak last year. It has come some way ... Last year's 'The Hedge at Poitiers' was a public test of the movement and combat concepts designed for GitS, was 54mm and was portable in a smallish box. It worked, and proved easy to play both for participants and presenters. 'Greyhounds in the Slips' has 90mm figures, a full layout, custom built masonry, and the integral set of Shakespearean speeches. We got a few good games in that busy window (a little short, up top, of course) between when the public reached the upper floor, and the mid afternoon petering out. An exception was the Mortimer's Cross game by the Lance & Longbow Society, nearly bang on the 550th anniversary of the battle (2nd or 3rd Feb 1461). It was fought using Poleaxed.
' 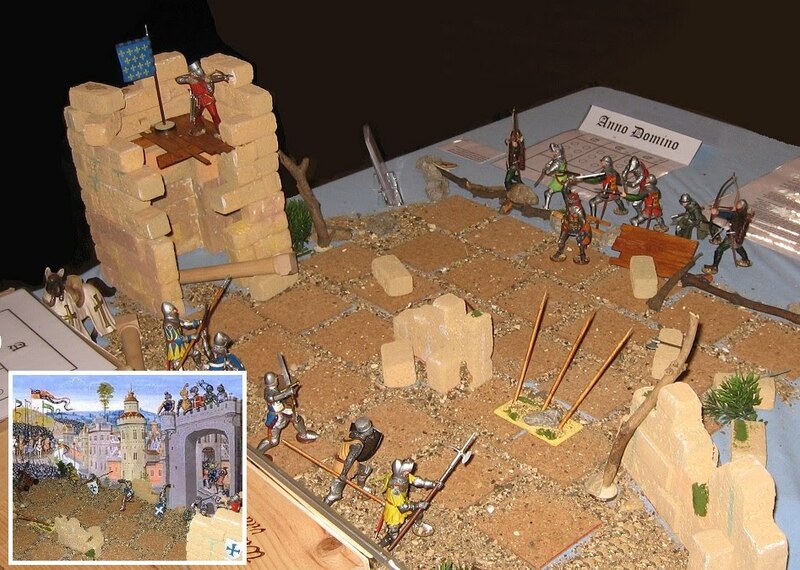 ... We used the troops and terrain as set out in the Poleaxed Source Book vol 1. 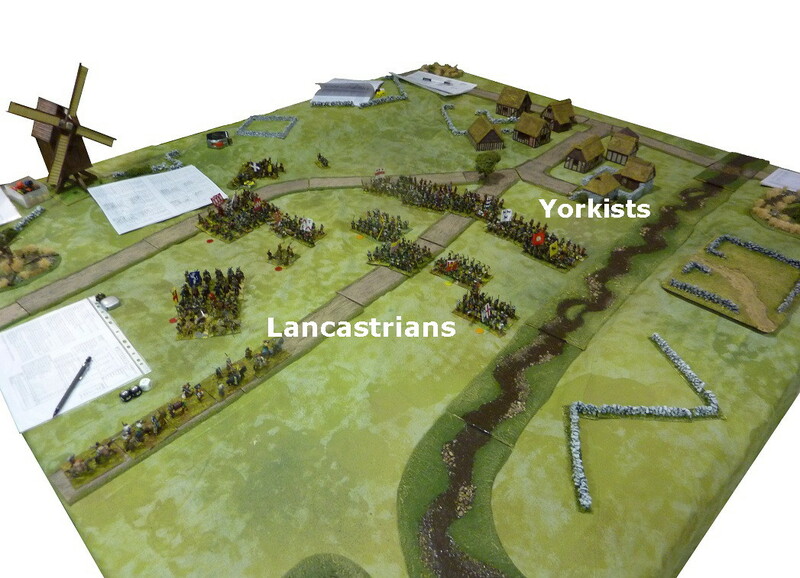 In both games the Yorkist line held its position and the Lancastrians advanced (as per the book). 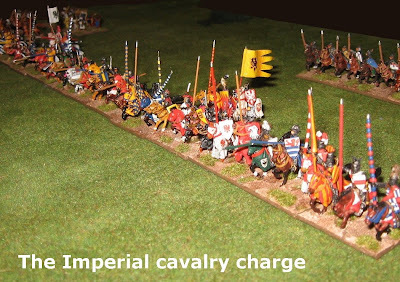 In the first game the effects of Yorkist archery and troublesome manoeuvering unsettled the raw levy/peasant Lancastrian left wing which was further dismayed by the appearance of the Yorkist cavalry on its flank. A quick trip round some of the other exhibits. I can't give a full explanation of most of them: captions and explanations were a bit thin on the ground at Vapnartak - so like most visitors, I haven't much of an idea what half the games were meant to be (check other blogs also ... the public were mostly left in the dark ...)..
That said, many of the games did look splendid - and in some case, the brush work was good too. Well, I'm sure the organisers of Vapnartak know what they are doing, and, in general, it is a very good event. They get a good, friendly atmosphere and are very welcoming. 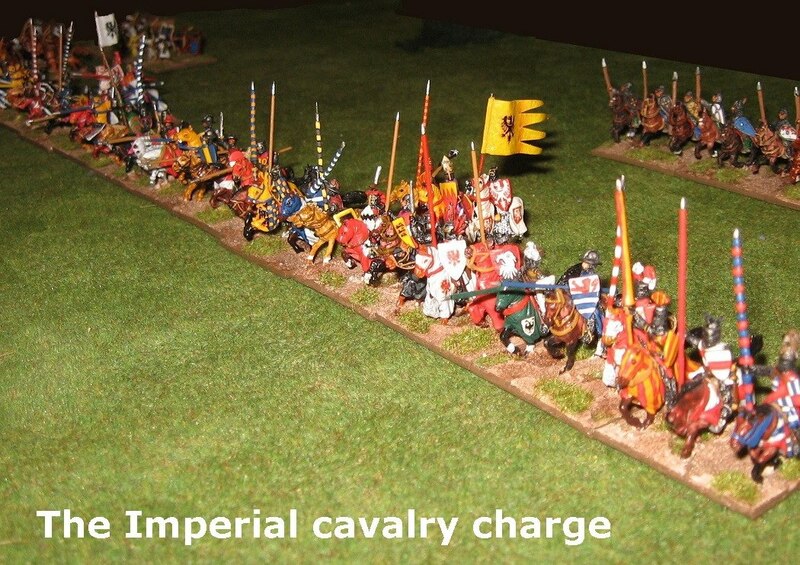 I do think this year that the 28mm brigade let them down a bit, though. (an early 20th cent. fantasy African layout .. I think ...).. Massive (needlessly massive) games, mostly a bit samey, and never really clear what the game was doing other than showing off large collections of toys, but without the pizzaz that makes that work ... meanwhile, on the upper deck, we had two participation games side-by-side, where only punters looking for a Bring & Buy bargain were likely to find them. Well ... different priorities, I guess. 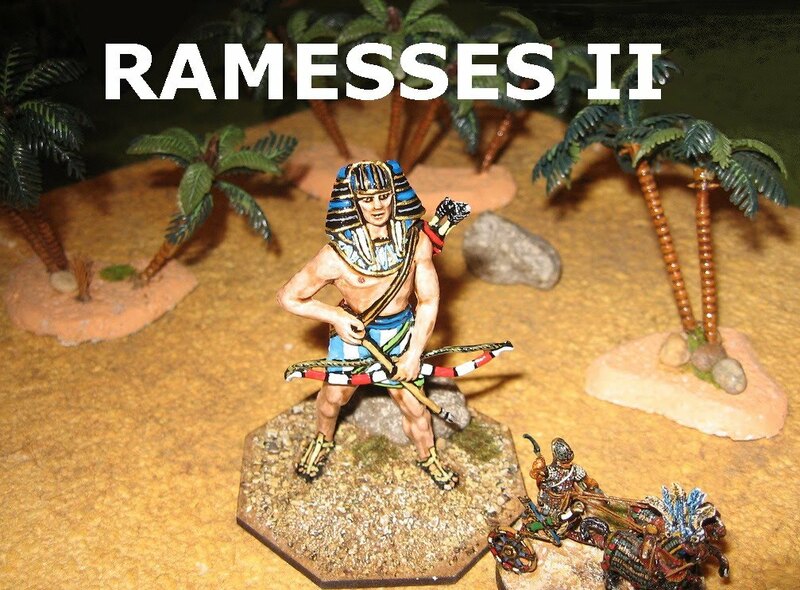 I wonder what the other feedback is like (I only read the 'progressive' blogs, not the gushy 28mm frothing ones, so I don't get an objective view ...)..
We were able to tidy up a few areas in our most recent project evening, and have a good Armati-based game working reasonably smoothly. I managed to persuade the guys that we should skew the orientation of the table by 30 degrees or so. Conventionally, the battlefield is depicted with a North-South axis, and instinct encourages following this arrangement on a rectangular table. 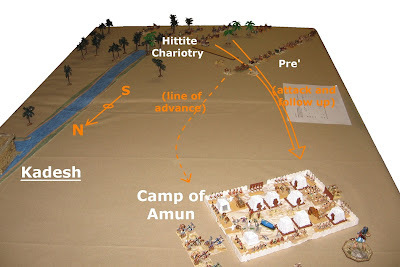 The plan shows Pre' marching due North towards the camp of Amun, and the assumption (with no particular foundation, of course) is that the Hittites attack from ambush at right angles to this due North march. I am more interested in translating what we actually know into a wargame that makes some sense of the military manoeuvres and monumental narrative. Not a particularly challenging pair of assumptions, but combined, tending to realign the direction of the attack on Pre' progressively towards the camp of Amun rather than away from it. This makes the wargamerly 'now go for the camp' pursuit phase easier to manage in terms of game mechanisms, and more coherent to the narrative. It is necessary, we have found, either to allow Pre' some free movement, or simply to set up on table. 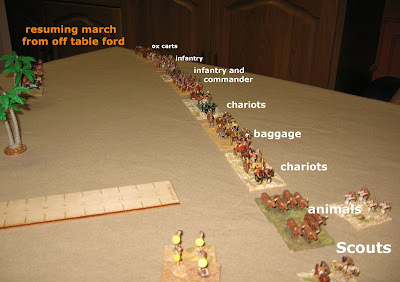 The order of march is shown on the reliefs (and Ian wanted us to get this detail right ...).. Scouts and chariots to the front, then animals on the hoof ... then the main body of chariots, followed by more baggage ... then the infantry, which is where, also, the commander seems to be ... then more baggage. By this account, the carts would seem to be at the back. For the purposes of the Armati game and mechanisms, we placed the ambushing troops within bow range, but not charge reach, and tried using the game's in-built 'initiative' mechanism to work the ambush. 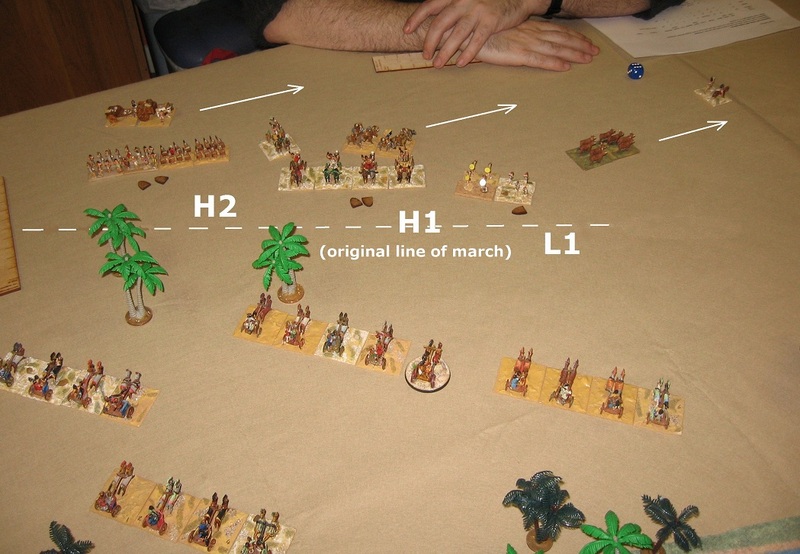 The Egyptians have an 'undeployed' -2 on their roll, but become aware of the enemy presence if they win. If they don't, the Hittites choose who goes first. If they don't, the Egyptians will be able to use the deployment rules (similar to those I employed for Arsuf ... here ..) and cobble together a position. We were broadly satisfied with how (and why) that played out. For what it is worth, the much damaged pursuers were no match Ramesses emerging god-like from repose in his chariot. 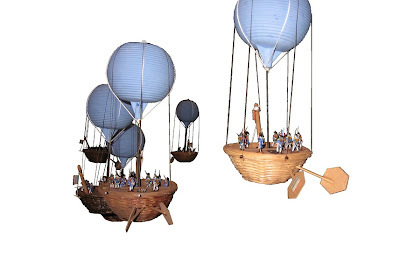 Well, in this game, the main Hittite chariot corps was one BP of breaking, and Ramesses was able to do this unaided. So, quirkily perhaps, being able to claim that he put the enemy to flight single-handedly ... We allowed ourselves a wry smile. This takes the game up to the end of the problematic phases 1, 2 and 3 (ambush, camp raid and Royal counter-attack). There then follows are more straightforward 'final battle' where both sides feed fresh divisions into the fray, in the plain before Kadesh. That presents fewer difficulties, of course. For interest, and played at 'test and discuss' pace, the phases 1 to 3 game described played through in a little under 2 hours. That should be about right for the Battleday plan of doing the whole battle twice during the day. Well, some apologies, first, for being a little quiet over the last few weeks. February is a very busy time for shows (something every week) and is pretty crammed with Society business too ... wrapping up last year and getting a grip on this. The first tick went into the Championship box, however. 2011 is underway. 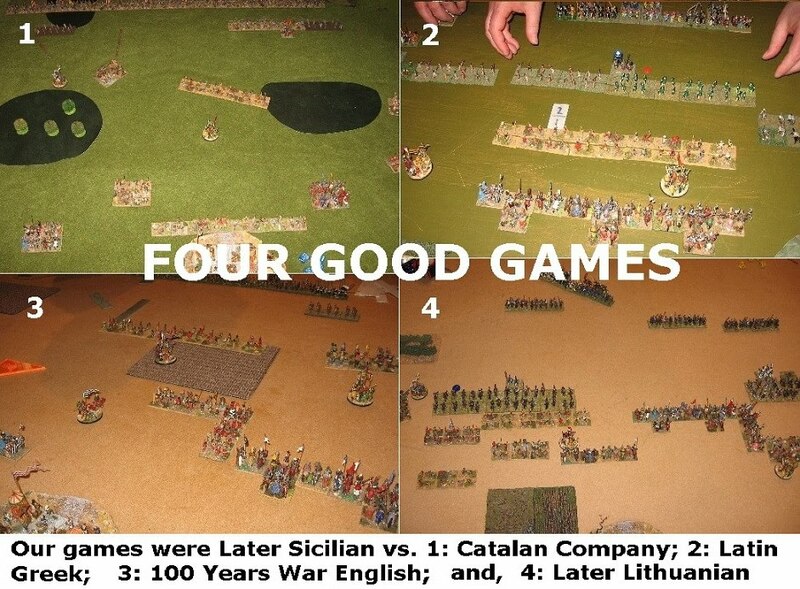 My first game was a Field of Glory encounter, my Condotta Italians against Richard's Later Sicilians. Not far off historical ... not far off Guelf vs Ghibelline. 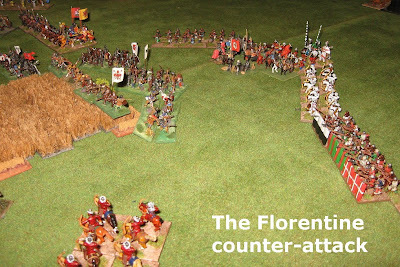 The Florentines have a big army, so must arrange their troops to give support and cover, optimising the advantage of manoeuvre and numbers. It started bad for them ... a classic wargamer's 1 in 36 allowing my crossbow skirmishers to get caught, bad dice making this a 'one phase' rout, and a big pursuit roll enabling Richard's victorious knights to career their continuing impact into the allied commander's retinue of English archers. Hmm - it wasn't meant to start like this! 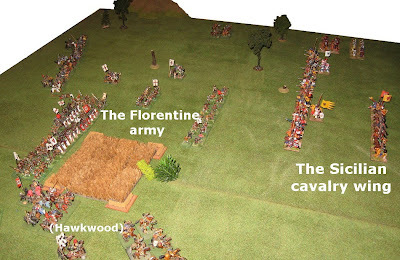 Fortunately, while this hole was developing within the Florentine ranks, Hawkwood was moving up some more knights and archers against the Sicilian centre which was being held by several bodies of (Medium Foot) Saracen archers. 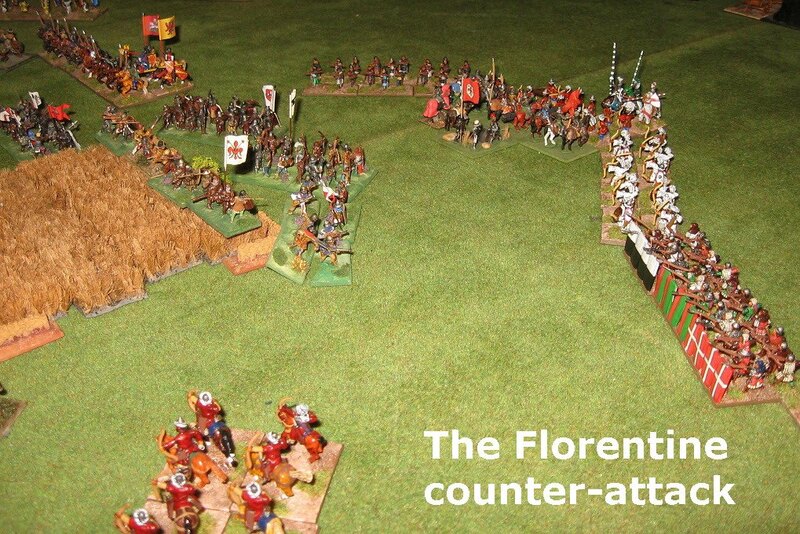 Provided the mercenary quality Florentines could withstand the Sicilian version of an arrow storm, these 'soft' infantry would not last long. 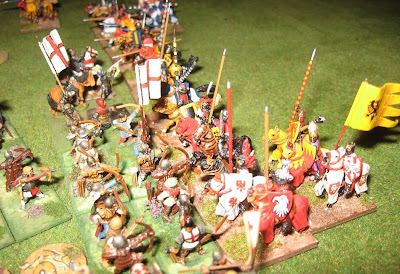 In the centre, although victorious to their front, the Imperial knights were getting engulfed (flank attacks), and just did not have the numbers to protect themselves. When the end came, it came quickly. The Saracens gave way, and their friends panicked. Deadly shooting turned panic into rout. Meanwhile, the main Sicilian attack had disintegrated with no survivors. It was valiant, but in the end numbers and drilled manoeuvre won the day. You can find out more about the Championship from the Society's main website (Championship pages) ... I hope you will be tempted to join in. It is an ideal reason to arrange a game with a fellow enthusiast, and provides a unique format where, whatever your county or continent, we can all join in as members. 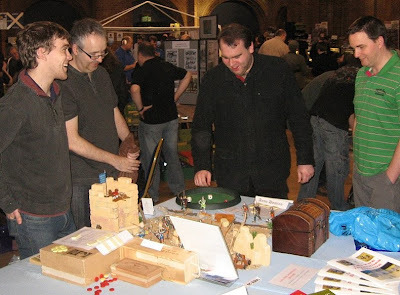 My games with Richard are a great example: we have been fellow enthusiasts for some 20 (25?) years, and played our 'regulation' two proper games a year as part of the old Championship. Now it is running again, it has given us an excuse to renew that tradition: where we might not have quite managed to schedule a game, now it is again a firm arrangement. I also like the simple win/draw/loss scoring. It reduces that gamey negative play (playing for game points) that spoils so many tournament games (playing the percentages rather than trying to win). So 'follow your spirit' as Harry might have said. There's ten and a bit more months to go, and the 2011 Championship is an open book, ready for you and your friends to write your names on it. Results submission can be done through the website, any mutually agreed rules set or games format can be counted and there are prizes as well as kudos for the notable performers (and that doesn't just mean the winners). You could also join us for a chat at Cavalier on the 27th. Finally, best wishes to our contingent of Kiwi Championship players and their families. It is obviously a distressing time for many New Zealanders, but we hope you are safe and we send our best wishes. This is a quick reflection on BattleDay preparation session no. 2. 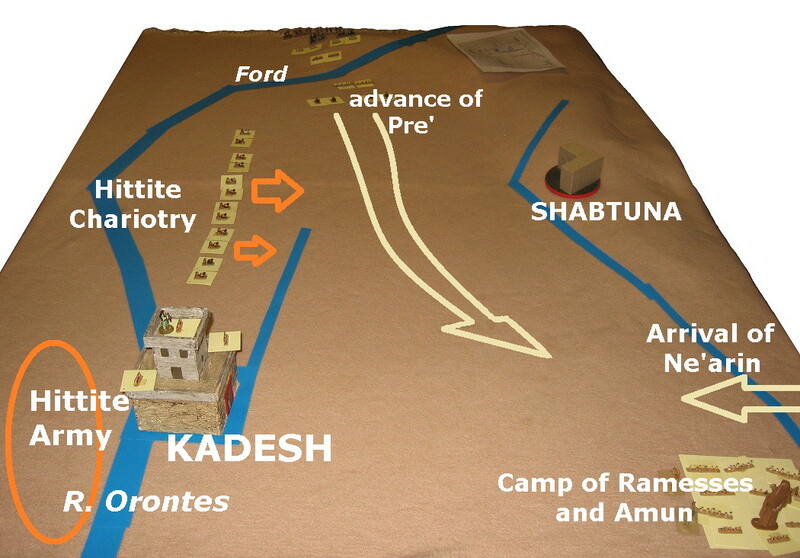 The Battle of Kadesh - an Armati treatment. This may well be what my group does for the Battle Day. If not, it may contribute to the Armati game being presented on the day. I last had a good long look at Kadesh at the beginning of this decade. I did a special presentation when Roll Call (still in those days a show as well as a competition) was at Kettering Leisure Village. 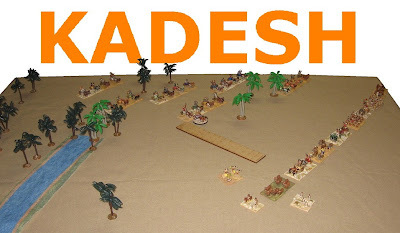 'Kadesh, Three Ways' was a little battleday, really, as I put on the battle 3 times each day, using 7th edition, DBM and Armati. Most participants (some of whom were committed DBM players) preferred the Armati version of the game as it remained fairly coherent. 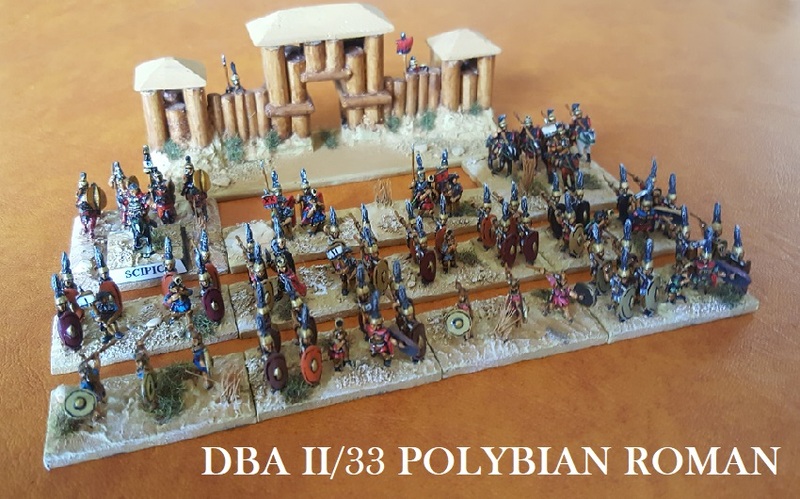 One DBMer who shall remain nameless described the battlefield in the DBM game as looking like somebody had just got several boxes of figures and tipped them out on the table. Despite being a criticism, of course, that is very much what happened. As Pre' and Ne'arin converged on the camp of Ramesses and Amun, Muwatalli's concealed chariots fell on Pre's line of march, dispersing them and pursuing on and into the camp. Only then to be bounced out and back across the Orontes by Ramesses, his personal retainers and the fortuitously arriving chariots of Ne'arin. So, forces entering the fray from at least four directions. Not untypical of the somewhat shapeless engagements of this period - but a potential shambles for wargames systems more generally conceived to handle two sides deploying more or less opposite each other across a definable battlefield. By now, of course, you will be following Ian Russel Lowell's briefings on the battle in Slingshot, and our starting point was a topographical table set up by Ian representing the whole area of the battles fron Pre's crossing of the Orontes up to the camp of Amun and Pharaoh. For this familiarity session, we used Ian's venerable 6mm forces on mock Armati bases, and the area was set up 'map -like' on a North/South axis. 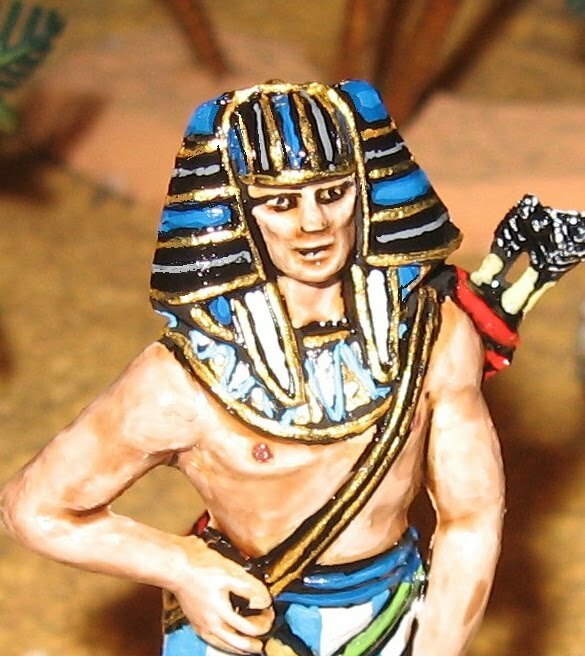 I have tarted it up a little (we intend to persuade Will - Mr Armati - that this giant should be Ramesses's 'general' figure in the game. Certain that is the way Ramesses would have had himself represented). The game itself went fairly well, but it is heavily dependent upon an entirely revised 'Chariot friendly' Armati, and it is important to get the various bodies deployed and orientated appropriately if you want the basic rules to generate for you a narrative that follows historical events. Of course, that is a key design issue in itself - how much do you want to manipulate/mandate the course of the reconstructed event so it mirrors the historical battle. Or how much leeway do players and chance get to generate an entirely different outcome? That supposes you agree on what really happened. There is more on Kadesh in Slingshot and on the website (where you can become a member if you want to follow Ian Russel Lowell's series in the magazine)..